The article below and also found here describes an interesting attempt by Camden, Maine to bring new, high-paying jobs to their community; put a brownfield, riverfront site back in use; and get a tax-foreclosed property back on the tax roll. And citizens were involved all along the way. Note that the town will still be on the hook for the clean-up costs when all is said and done. It would be interesting to see the overall fiscal analysis and how the added jobs & property/income/business taxes collected might offset that. I’m not suggesting that this is directly related to any Pottstown property or situation, but merely wanted to bring it to readers’ attention and add it to the Revitalization Library. It’s an innovative approach to jobs growth and brownfield re-use that’s worth watching to see if there are any takers. Free land, anyone? In an effort to attract business, to bring well-paying jobs for residents and to collect taxes, Camden is giving away 3.5 acres of riverside land to anyone who wants it – with a few caveats. The future owner of the land will have to pay $200,000 up front. Then, for every eight workers hired, the owner will get a third of the purchase price refunded. The company will have five years to hit the 24 employee mark and get the full rebate of $200,000 before the offer expires. The jobs also have to pay more than the average wage for Knox County – $45,165 including benefits, to be exact. The land also will be challenging to build on. The site sits beside the Megunticook River, and used to house Apollo Tannery, which allowed tanning solvents to run into some of the land’s soil. The town took ownership of the old tannery in 2003 after the previous owner didn’t pay his 2001 taxes. The town is still paying for the property – the tannery needed to be torn down and some chemicals had to removed – which set residents back $836,000. Camden bonded the issue and still has $683,000 to pay off. Eddy said the property is commercially zoned, but in a residential neighborhood and consists of a paved lot, the tannery solvent-contaminated area and open space. A future owner can build on the property, but may have to tiptoe around the contaminated area; although Eddy said sometimes government agencies allow property owners to build on top of the contaminated soils. Eddy said that trying to sell the abandoned industrial slot this way and making it work for Camden is exciting. The idea was originally brought up by a citizen group and then voted on by the whole town sometime around 2008, Town Manager Roberta Smith said. But the recession hit, so Camden held out on selling. Marketing for the property just started up this month. There are other examples in Maine of communities giving away brownfields, according to Eddy. There have been some calls on the property, but nothing serious yet, Eddy said. There is no deadline for business owners to contact the town, according to Smith. No buzzkill intended, but you probably need to dig just a little deeper on this story. I’ve been visiting Camden Maine for over 30 years, and at one time they had quite a lively community on the waterfront. Ten or fifteen years ago most of those folks were chased off by insanely high real estate values (read taxes, rent, etc). Back then it was a cool little community that included a book store, a record store (hey, I said a while ago!) at least one, and I think two art galleries, and even a luthier, a couple of very nice restaurants, and one or two lunch carts (serving lobster rolls) among others. Oh, and of course the wind jammers, whale spotters, and privately owned yachts. Last time I was there (a couple of years ago) the main street was still doing alright, but not as well as years past. The waterfront was sad, better than it has been, but still sad because of the lack of vendors. I’d never have classified it as dirty, but it certainly has been cheerier in years past. I bring this up so that folks looking into Camden Maine can learn not just from their successes, but also their failures – nothing wrong with NOT repeating history, even if it isn’t your history. No, not buzzkill at all, Bill! This is the kind of conversation I’m hoping to generate. I’m not suggesting that Pottstown do or be Camden, ME, or any of the other towns whose examples we might look at. It’s just good to see the range of what other towns are experiencing and how they go about solving their problems, so that Pottstown can have a wider understanding – a kind of broad redevelopment palette – from which to choose when it decides its own strategies. I’m glad for the historical perspective you’ve provided. Sounds like Camden may actually be on a slow, downward trajectory. You’re absolutely right about learning from other towns’ failures. I’m a little skeptical about Camden recouping the money they sunk into remediation. My town here in NJ went through an analogous situation, and prepared a large parcel (250 acres), that it owns, for partial redevelopment and partial open space, then the financial markets collapsed along with that vision. While we may recoup some funds if the county purchases the site strictly for open space, we won’t get back everything that was spent on remediation. On the other hand, there’s a public school in the middle of the property and now it’s a clean, safe site, where before it had 100 deteriorating buildings, an asbestos-lined steam pipe running around the property and a few other hot spots. (It was a former state developmental center.) Such are the risks – with taxpayer dollars – that have to be taken into account when government takes a more aggressive development stance. I think Mr. Thompson in his critique undervalues the qualities of Camden that make this a great place to live. As a visitor with certain taste preferences who apparently has not been to Camden in years, according to his own admission, he fails to take note of the facts that caused a major corporation to site many of its facilities here in the ’90s – the fact that it is a town within one of the most beautiful natural regions in the entire world (still). Camden Maine has many of the amenities that come with being a town with none of the hassles that come with big cities. Shopping and the proximity of people who congregate around a world class Camden Public library, art, culture, and restaurants, and in microcosm, the best of what Maine offers; fresh seafood, local produce, organic meat and produce. Camden Maine offers the great lifestyle activities that folks in the big city have to travel to and pay a heap of money to enjoy. We have hiking, kayaking, sailing, camping, ice fishing, snow shoeing, skiing, etc, etc, and many more activities so close that a lot of residents enjoy them after work (not just on vacation). Filled with well maintained historic, federal, Greek revival and Victorian style buildings, neatly landscaped and gardened, it’s truly a unique treasure. Each year thousands of people come from all over the world just to walk around and look at the Maine coast, the Summer on Penobscot Bay, and the fall foliage in Autumn. I meet many of these people, and they unanimously comment about how their own communities could use some of what we have. I can remember attending a round table discussion in the Camden Public Library one evening where multiple NY Times Best Selling authors were speaking, and there was no admission fee -, and I found a seat easily and comfortably (and I walked there)! Where we used to live, not only would I have had to pay for admission, if I was lucky enough to get a ticket, I would have had to pay bridge and highway tolls, drive for anywhere between twenty minutes and two hours depending upon traffic, pay to park, or take public transport and pay, in time mostly, and then pay to eat, and wait in line for the privilege of each of these segments of my trip. Having lived in New York City (grew up there) much as there is to love about the city, I can tell you that to enjoy this lifestyle, it was well worth the trade offs from the city conveniences. While the phrase “quality of life” may sound like a cliche, in the case of Camden Maine, the value of the contribution made to one’s quality of life by living in Camden can’t be measured purely in dollars or economic statistical data, and with all due respect to Mr. Thompson, it is not something a visitor can appreciate; meeting people you know and who know who you are wherever you go – at the YMCA, at the Snowbowl, at the Soccer field, when you buy your groceries, or check out a book at the library; the strength and value of true community with a population small enough not to take each other for granted is something truly amazing. As opposed to many working-aged persons in other communities who live for the day they can finally retire and move away, our citizens wouldn’t dream of leaving here and many of them deliberately chose to come here from other places. It isn’t for everyone, but the bland criticism that the harbor area doesn’t seem to shine as brightly for a person who has been a visitor on and off for a number of years is hardly a fair evaluation for an employer who may be interested in attracting talented employees. Many people choose to live here and to take a decrease in pay from big city rates, educated, accomplished people, simply to raise a family or to enjoy the natural scenic beauty and opportunities it provides. As far as “sinking money into remediation” the cleanup of such a problem is a matter of local pride, and the kind of blemish a town like Camden would not permit to remain. Cleaning the environment is priceless, the thought of recouping the money could not be counted. But even if such an appraisal were valid, considering the potential of 25 new jobs at $48,000 a year, that’s over a million dollars a year into the local economy. The buy-in for a business at $0.00 is well worth the sticker price, after the $200,000 in rebates. As for the Harbor – it doesn’t lack. The existing businesses paint and polish their facade’s annually, the streetsweeper still runs up and down main street, the Camden Garden Club still maintains enormous flowering planters on the period streetlamps, as well as the flowers in pots on top of wastebaskets, and along the bridge over the mill stream, the windjammers are refurbished at the start of each season, and at anchor remind one of a bygone era but not because they look anything but new. At the unfortunate moving-on of a downtown business, as periodically occurs, for whatever reason (over the past 5 years just as many have outgrown their downtown space as have gone out of business) on each occasion something quickly takes it place. There are no strings of vacant shop windows here or trash. In fact, when Dunkin Donuts tried to elbow into the business on Main Street about a year ago there was such an uproar of protest, they decided to give Camden a pass (but not because they thought traffic wouldn’t support the business). I am astounded each time I think that the fabulous Knox Mill facility would make a perfect corporate HQ, or facility for many kinds of businesses, the amazing value represented by the Tannery site, -, a college or university -, the possibilities are endless for a business to move to Camden Maine and to enjoy the benefit of a contented talented pool of employees. Wow. I’m floored. Kristen, thank you so much for your eloquent and heartfelt description of your town. Every community would be fortunate indeed to not only have such a range of amenities and communal spirit, but also an advocate like you. As the host of this blog, I didn’t do my due diligence when bringing up Camden in the first place because I forgot to add important links like that of Camden’s Chamber of Commerce, which does an excellent job, in writing and pictorially, to support what you’ve described. In now going to the municipal website, I came across this invitation to residents to participate in upcoming economic development meetings and strategizing. And the town’s press release regarding the town’s approach to the site, as well as the separate website/marketing tool, are admirable. I hope my hometown of Pottstown will be selling itself like this someday very soon! Regarding the money spent on remediation, I envy you your community’s overall attitude. I – and many others in my town here in NJ – felt the same way: that cleaning up a site, which our state government had let languish in our midst, was the responsible thing to do. But when the economic downturn made its compact redevelopment no longer feasible, that noble effort to clean up became a political liability that is still being wielded against leaders who advocated smart-growth, sustainable development and open space preservation for nearly a decade. Sometimes it seems you can’t win. Thanks again – this is a really great conversation. Wow… my apologies if my original reply was inferred as a slam on Camden, it was not intended as such. I don’t live there, but I and my family have toyed with the idea of moving north. My wife and I spent part of our honeymoon in Camden (splurged at the Norumbega) in fact. The entire mid-coast area is wonderful! The harbor in Camden, however, is not what it once was, and I inferred from the OP that it was specifically the harbor that was the issue. I know all about MBNA moving to Camden, and I am surprised that the view from the Camden Snowbowl was omitted… there are few places I know of where one can see the ocean while skiing! The actual harbor is only one part of the equation for a family or business considering the Camden area, but it was the issue that seemed to be on point. And as one that was watched the harbor area change over the last 30 plus years I stand by my original post, as of my most recent visit (three summers ago now) it is a shadow of it’s former self. If that has changed I am thrilled, and when my kids are just a little older I’ll be dragging them from Belfast to Pemaquid to see the sights. I’m pretty sure the Smiling Cow will be as big a hit with them as it was with me – when my folks were footing the tab! And I’ll spend my fair share of time in the various book stores! So really, don’t take offense… I love the entire Mid Coast region! It is a rare combination of scenery, places to shop, and people that make it so great. PS – just curious… do they still have their wonderful TGIF parties? Okay, now I’m curious – what were/are the TGIF parties? I want to visit a luthier! Interesting conversation- as usual! YES! For awhile, my younger son was saying that he was not going to college and was going to become a luthier. I said, “Go for it!” He did a workshop last summer at the Philadelphia Furniture Workshop for a week and in the same building, there was a luthier named Victor Baker. (Looks like he’s since moved to Brooklyn.) One of his instructors took him to meet Victor at lunch one day. (The guys who run the Phila. Furniture Workshop – Alan Turner and Mario Rogriguez – are awesome dudes!) My husband dreams of one day owning a vintage guitar shop, and I think Pottstown is just the place for that and for luthier studios. There are the Beech St. lofts and the lumber place (name escapes me) that was always at the corner of Hanover and East Sts., now closed. There are all kinds of workspaces that would be compatible for craftspeople in P-town. Well you’d both enjoy meeting Ron Pinkham (you can find his site at woodsoundstudios.com) and, he is (or was) quite outspoken about being chased out of the waterfront area! He was always very generous with his time – pretty sure he knew a college kid wasn’t going to be dropping $3000 or more on a hand made guitar!!! But I did spend quite a bit of time hanging out there watching him build and repair various stringed instruments. He used to build this one particular guitar, an orchestral model with a wider than normal neck that sounded awesome and played like a dream. See how easy it is to get me to wander off topic when you mention guitars? Oh, yeah, I mentioned them. I’d love to see more energy spent trying to get artists and artisans to come to Pottstown, and historically that’s the type of business that has been the beginning of the revitalization for an awful lot of areas. But in the current economic climate I’m not sure it’s the best way to go. I do believe that private businesses are the best way to go… depending on money from outside the community is tricky in good times, and I think risky right now. If there is state or federal money it’s going to go to education and infrastructure, and probably rightly so. Very difficult equation to balance – you need safe streets, minimal blight, good schools, reasonable taxes to support all those things, and to get the later you need a tax base, but to attract the tax base you need the former…. ooh, my head hurts! I’ve just stumbled across this blog today, so I don’t know what has and has not been discussed, but it seems to me the first two case studies are right in our back yard – West Chester and Phoenixville have both transformed themselves, with WC in the lead by a bit. Then there is Baltimore’s inner harbor… an outstanding example of what can be done… but they had LOTS of federal money to help them. I do have to agree with your sentiments in the original post… it’s a gutsy move, but free land, or tax free operation, or some combination of the two will probably build up the tax base faster than any other move – especially the ever increasing tax rate game. But that is what some might call a gutsy move! Uh-oh – I think I’m hearing that Bill is a guitar guy… they’re everywhere! I checked out his (Ron Pinkham’s) site – looks very good. I saw some mandos there. My brother-in-law in California has a couple from luthiers in the Pacific northwest. Can’t remember their names now. Beautiful workmanship and sound. “Very difficult equation to balance” – you got that right. I’m also not sure what’s “right” for Pottstown at this point; it could spin out in several different ways and along parallel tracks. There is a budding arts community in P-town that provides a very good base from which to expand, and people in the arts are generally risk-takers who gravitate toward areas with less expensive real estate, which Pottstown does offer. An arts community could give the needed boost while other efforts to improve all the areas you mention could be implemented. There are also more conventional businesses that can and should be courted, given the variety of spaces available, from industrial to light manufacturing to commercial and retail. If there were a coherent vision, theme, marketing angle – whatever you want to call it – that the various sectors could rally around, I think it would make it easier to market the community overall. West Chester and Phoenixville are inspirational, local examples, although Pottstown is bigger in area (slightly in population) and, it seems to me, has a plethora of interrelated urban problems that are not as pronounced, say, in Phoenixville. Not sure about West Chester, although their downtown seems more compact to me. High Street, from Manatawny to Armand Hammer presents several different challenges along its length. In general, I’ve been advocating for a community planning/visioning process to nail down how it wants to tell its “story” and, as a result, how it wants to market itself to new businesses and the arts. Supposedly, there is Montgomery County redevelopment money that would also flow to Pottstown if it got its act together. It is mentioned as the “regional hub” in every county planning commission plan, document, etc., so whatever outside funds might be available, it would stand a decent shot of getting something. If you check the categories of “planning,” “First Suburbs,” “revitalization,” and “revitalization library” on this blog, that’s where the bulk of these kinds of posts are filed. I feel like we’re just getting started. guilty as charged… and I almost bought one of Ron’s guitars six years ago when I finally splurged on a handmade guitar, but at the time I had a really great OM style instrument, and what I did not have was a really great Rosewood Dread, so I ended up buying a Santa Cruz. There are scads of great luthiers in the Pacific Northwest, Breedlove is there, and if I were ever to buy another guitar specifically for fingerstyle it would come down to Breedlove vs Pinkham. There are a bunch of other great instruments out there as well, but the price tags rapidly climb far above what I could ever justify these days. I think West Chester of the late 1970s/early 1980s shared a lot of the problems Pottstown still faces. I grew up there, and I’ve heard many tales of how they turned it around, but I don’t know that I ever heard the real story!!! From observation it always seemed to me that the restaurants were the ones that took over the main drag first, and when there was suddenly activity at night everything else just sort of followed. And keep in mind none of that happened overnight! Phoenixville is well along the way, and they seem to have done it by focusing on the arts. Doesn’t hurt that they have the Colonial Theatre. Can’t recall the name, but there is a wonderful old theatre on High Street, at one time someone was trying to renovate it, have no idea what happened to that idea. I was involved with a music school on High Street… one of the problems was that a lot of parents weren’t thrilled with bringing their kids there after dark, and there are only so many hours of daylight during the school year. I don’t know about the size issue. Pretty sure the High Street corridor in Pottstown is longer than the Market/Gay Street corridor in West Chester, but, they had four sidewalks to address, Pottstown has only two. And even so, even West Chester has not completed their process. If Pottstown could revitalize even a small section maybe half a dozen blocks centered on Hanover perhaps, that’d be a start. I will check the other areas of the blog… I’d love to see all, or even most of the old buildings brought back to life. And Sunnybrook of course!!! I cannot even begin to converse about different guitar styles, etc. I hear it and see the guitar magazines floating around the house, but it’s just not my thing! On the revitalization front, I don’t think any of Pottstown’s original theaters are still standing. The old Newberry’s department store has been converted to a really wonderful regional theater. Don’t know if you’ve been there yet, but they are putting on some great shows and bringing in renowned musical acts – it’s the Tri-County Performing Arts Center – http://www.tripac.org. 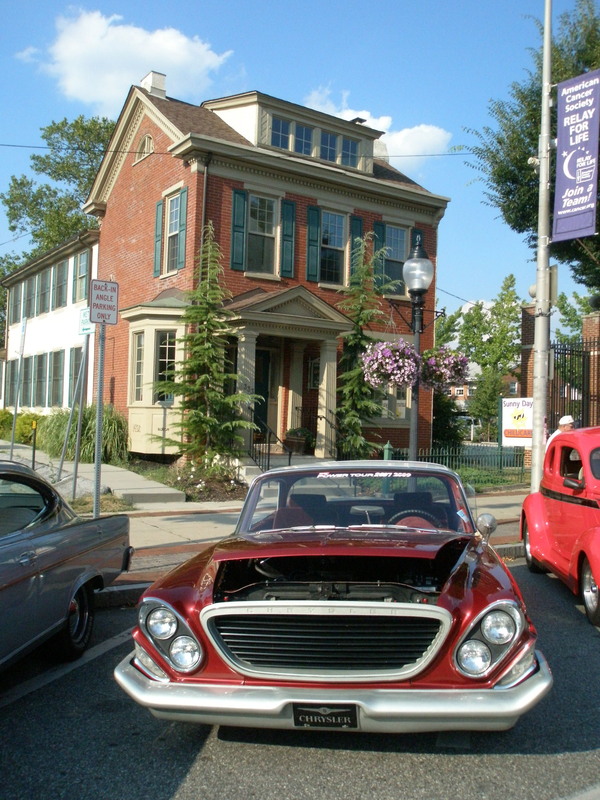 The Pottstown Downtown Improvement District Authority (PDIDA) runs a Main Street Program – the same type of program that got Phoenixville where it is today. Their coverage includes High Street from York to Evans, so you’re on the right track. They’ve got a new manager in place now – Leighton Wildrick – and he’s brought in some new energy and is putting some cool things in motion for the upcoming holiday season. And also not sure if you know, but there’s a group that’s done a lot of work on Sunnybrook, and they’re holding events every weekend. Between the various arts and music ventures going on, I can barely keep the calendar current on this blog! And while I’m at it – there’s the Gallery on High/Gallery School of Pottstown. Well – just go to the Pottstown Arts & Cultural Alliance’s website for the scoop – http://www.pottstownarts.org.